At a time of transition in my life, I had a dream about a red tailed hawk flying into the woods and becoming a great horned owl. I was curious to know if there was a message for me in this dream. I learned from Ted Andrews' book, Animal Speak, about the spiritual power of animals, as understood in Native American wisdom. This song emerged as a result of the specific knowledge I gained from Andrews' book, and from a sense of connection I began to feel with these two birds of prey. Interesting was the fact that red tailed hawks and great horned owls are matched in that they share the same territory for hunting prey. I learned that having owls appear in your life can signify a need to turn more inward, to do soul level work. This was meaningful to me at the time of the dream, because I'd just been offered a chance to live as artist in residence at a Quaker retreat center for nine months. 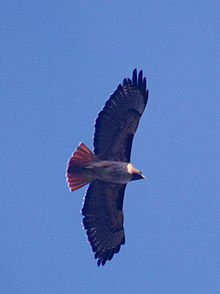 A red tailed hawk can signify an alert to pay attention, because an important opportunity is near at hand. The dream actually played a part in my discernment, to accept the opportunity. "The owl spirit animal represents a deep connection with wisdom and intuitive knowledge. 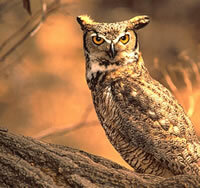 If you have the owl as totem or power animal, you’re likely to have the ability to see what’s usually hidden to most. When the spirit of the animal guides you, you can see the true reality, beyond illusion and deceit. The owl also offers for those who have it a personal totem the inspiration and guidance necessary to deeply explore the unknown…"
One by night, and one by day.